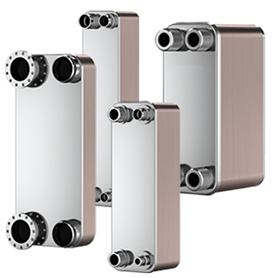 Rugged, reliable Taco Brazed Heat Exchangers represent the latest technology in high-performance heat exchangers. The Taco TB Series is designed specifically for domestic hot water applications, in-floor radiant heating, snow-melt, pool and spa applications (except salt water) and in general a more compact alternative to plate & frame and shell & tube type heat exchangers. These compact units feature copper brazed, stainless steel plates that offer a highly efficient, low fouling transfer service. All units have male pipe thread fittings, and mounting stud bolts are standard. For pool and spa applications, that are not salt water, materials will be SMO (chloride rates up to 900 ppm) for the plates and copper brazing. • Sizes(in): 3x8" - 14.5"x 34"
• Connection sizes: 3/4" - 4"